Skagway, Alaska, is located at the top of Lynn Canal on the Northern end of the Inside Passage. We arrived here on a cloudy Tuesday morning, to join the three other cruise ships already docked at the pier. 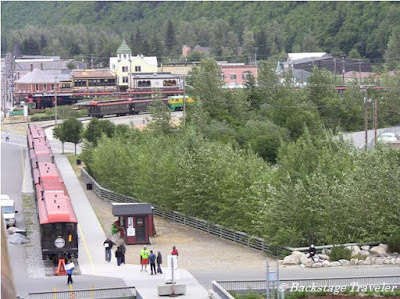 Skagway may have a population of about 860 year-round, but during the cruising season the daily population can swell to 10,000. Many of these visiting cruise-ship passengers will likely take a trip on the historical White Pass & Yukon Route Railroad, which conveniently runs right down to the edge of the cruise-ship dock. This narrow-gauge railroad was dreamed up in the midst of the Klondike Gold Rush of 1898, when tens of thousands of gold seekers stampeded north to chase their dreams of striking it rich. It is an engineering marvel, having been built through miles of rocky mountain terrain in harsh weather conditions. Amazingly, the railroad was completed in just 26 months by 35,000 men, between May 1898 and July 1900. In 1994, it was named an "International Historic Civil Engineering Landmark" by the American Society of Civil Engineers, a designation that it shares with other man-made structures such as the Eiffel Tower and the Panama Canal. 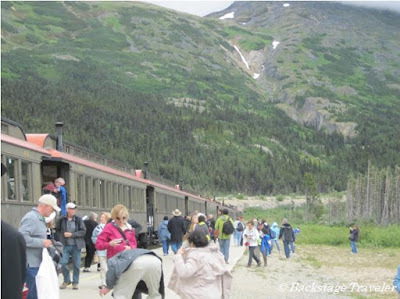 Today, the White Pass & Yukon Route Railroad operates during the summer tourist season, carrying hundreds of thousands of passengers up to the White Pass Summit (elevation: 2,865 ft) and into British Columbia and the Yukon, Canada, following the route of the gold stampeders. We took a shore excursion combining a northbound train to Fraser, B.C. 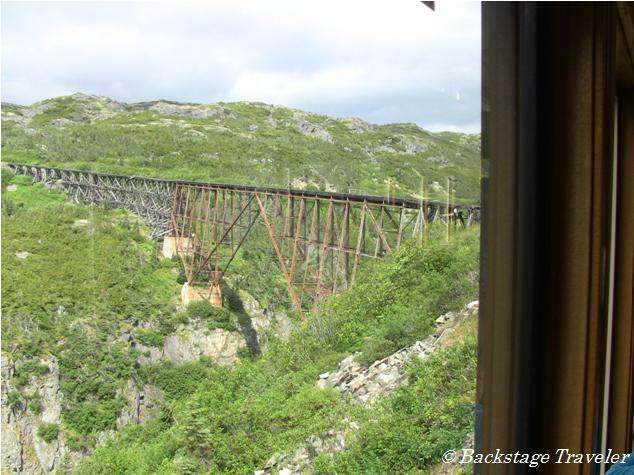 with a bus ride back on the Klondike Highway, but the train ride can also be booked as a round-trip. 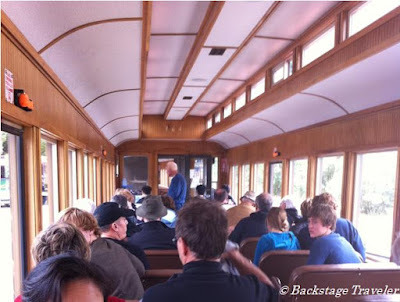 We were welcomed aboard our train by uniformed conductors who seemed to have stepped out of the pages of a history book. Inside the clean and comfortable train car, there were large windows, padded seats and a convenient restroom located at the back. A non-working cast-iron wood stove lent an air of nostalgia to the wood-paneled interior. The trip to Fraser took about 90 minutes, winding through 27 miles of wilderness on the climb up to White Pass Summit and beyond. 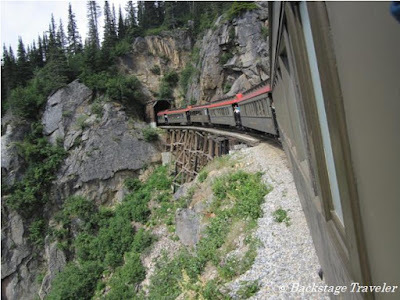 This scenic train ride took us through many steep turns, crossing trestle bridges and passing through two tunnels along the way. Travelers looking out the left side of the train on the way up were rewarded with many beautiful panoramic views of the valley below, with its rushing waterfalls and flowing rivers. 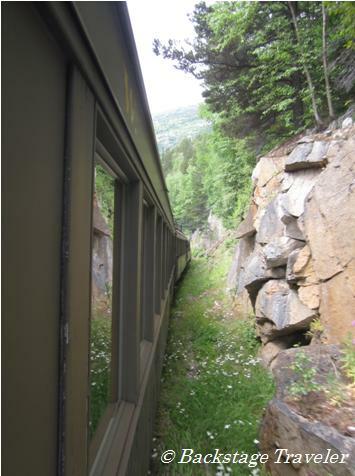 The right side of the train offered views mainly of the side of the mountain. An on-board guide provided commentary of the history behind the main sights along the way, such as Black Cross Rock, Dead Horse Gulch and the tallest steel cantilever bridge in the world, which is now no longer in use. 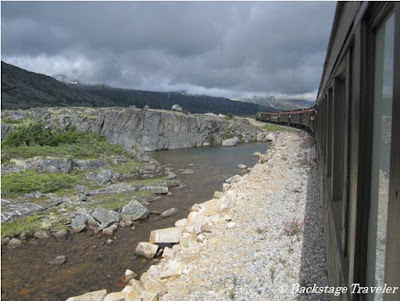 An especially exciting aspect of this trip was the opportunity to step outside onto one of the train's platforms, located in front or behind each car, and see the panoramic views unimpeded by glass windows. The smell of pine forest and the sound of the train's wheels turning on the tracks added an exhilarating depth to the experience of this special journey. Nearing the White Pass summit! As we climbed higher, the pine forests gave way to a more barren landscape, with small lakes of glacial water sprinkled among the rocks. 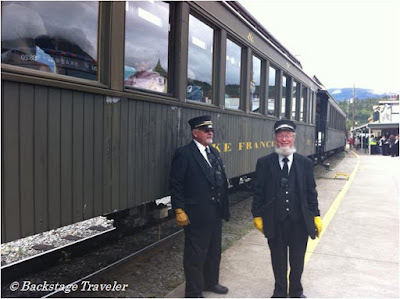 Upon arrival in Fraser, B.C., we waited on board the train for the Canadian customs agent to check our passports, then disembarked and joined our bus for the ride back to Skagway. This article is about the first part of our shore excursion "Gold Dredge, White Pass Rail & Scenic Highway", that was purchased through Holland America Line on board the Zuiderdam. Overall, this excursion lasted almost 5 hours in total. The train ride was approximately 90 minutes. The tour cost $169 per adult and $99 per child. We took this excursion on July 19, 2011.